In Maui, there are many spectacular and romantic wedding locations. 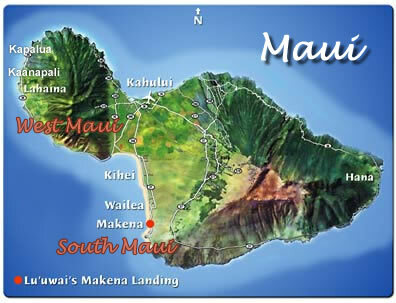 The location of your wedding is probably the most important consideration if you are looking to be married on Maui. My best advice is to get married close to where you are staying. Beautiful sunsets are seen year round on both South and West facing shores. The most popular wedding we provide are those performed on the beach. The beach is a beautiful venue and and there are no additional costs associated with weddings done there. All other wedding locations (Churches, Estates and Resorts) usually involve additional fees. The weather is usually a little more dry in the South, although rain is not a big problem on either side. Winter is when we get the majority of our rainfall. The South averages about 6-9 inches per year whereas the west get 15-20 inches. Temperatures get to 90° in the summer and only about 80° in the winter. View our favorite wedding locations in South Maui and West Maui. We will give you the pluses and minuses of each location. We usually decide on a wedding location prior to your arrival but are happy to make site change requests up to the day before the wedding. We will help you with dinner reservations if needed and can even host your reception if you plan on having guests. A few of our locations are excellent for both the wedding and the reception. Email us with your questions or call 1-800-395-7807.